Pure, as one of the leading CRIS (or research information management RIM) systems, has facilitated the emergence of exciting opportunities for research organisations to transform their support for researchers, with many research libraries taking an increasingly important role. Broadly defined, RIM is the aggregation, curation, and utilization of information about institutional research activities, and as such, intersects with many aspects of traditional library services in discovery, acquisition, dissemination, and analysis of scholarly activities. OCLC Research has been working with members of its international OCLC Research Library Partnership, including the University of St Andrews in Scotland, on a publication to help libraries and other institutional stakeholders to understand developing RIM practices and, in particular, their relevance for service and staff development purposes. 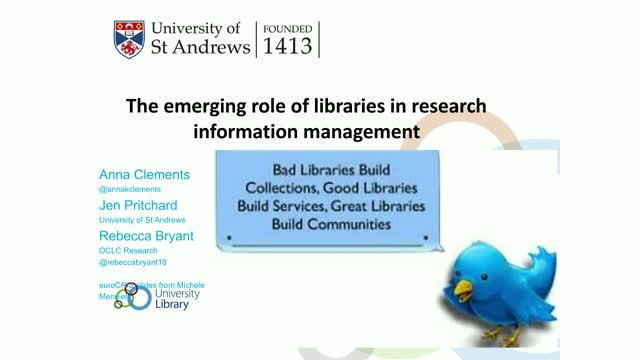 In this presentation, we will provide an overview of the OCLC position paper and provide a case study from the University of St Andrews.